Found in Madagascar, Mauritius and Reunion Island in damp, evergreen forests at elevations of 700 to 1700 meters as a medium to large sized, warm to cool growing terrestrial or epiphyte with 2 to 3, the oldest green & discoid, the newest enveloped by sheaths, cauliform pseudobulbs carrying 3 to 4, narrowly lanceolate, acute, plicate, undulate margined, longly acuminate at both ends, petiolate base leaves that blooms in the late spring and summer on an erect, that blooms in the spring and summer on an erect, longer than the leaves, 16 to 32" [40 to 80 cm] long, peduncel enveloped by 3 to 4 basal sheaths and several sterile bracts becoming caducous above, rachis 4 to 8" 10 to 20 cm] long, loose, 12 to 15 flowered inflorescence with very caducous, lanceolate, very acute, as long as to a bit longer than the pedicel and carrying very large, variable colored flowers. 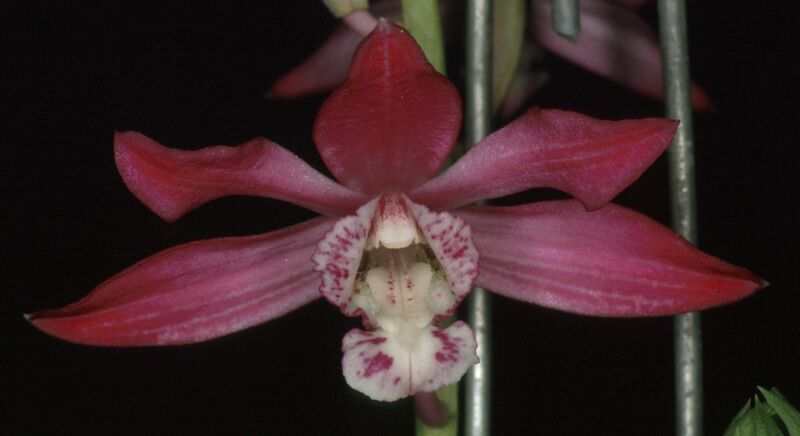 Phaius pulchellus var. sandrangatensis Bosser 1991 Photo by © Lourens Grobler.